Worldwide view of Earth on 22 October 2010 showing several tropical cyclones in action. Mother Nature is reminding us that hurricanes seasons of 2010 are still ‘alive and well’ throughout various ocean basins that are focuses of cyclogenesis worldwide, as can be seen on a “mapa mundi” view of Earth on 22 October 2010, which shows two major hurricanes, a tropical storm, two tropical depressions and one tropical wave in action. Satellite view of Cyclone GIRI as it about to make landfall in Burma, just north of Ramree Island, on 22 October 2010 as a category 4 tropical cyclone. Also today 22 October 2010 Cyclone GIRI, has made landfall in Burma, in the region of Akyab, Myeboa and Kyaukpyu, as a category 4 tropical cyclone. This storm formed in the Indian Ocean and within one day grew to category 5 strength as it moved toward the northeast through the Bay of Bengal. The cyclone lost some strength, but remained a category 4 storm through landfall. 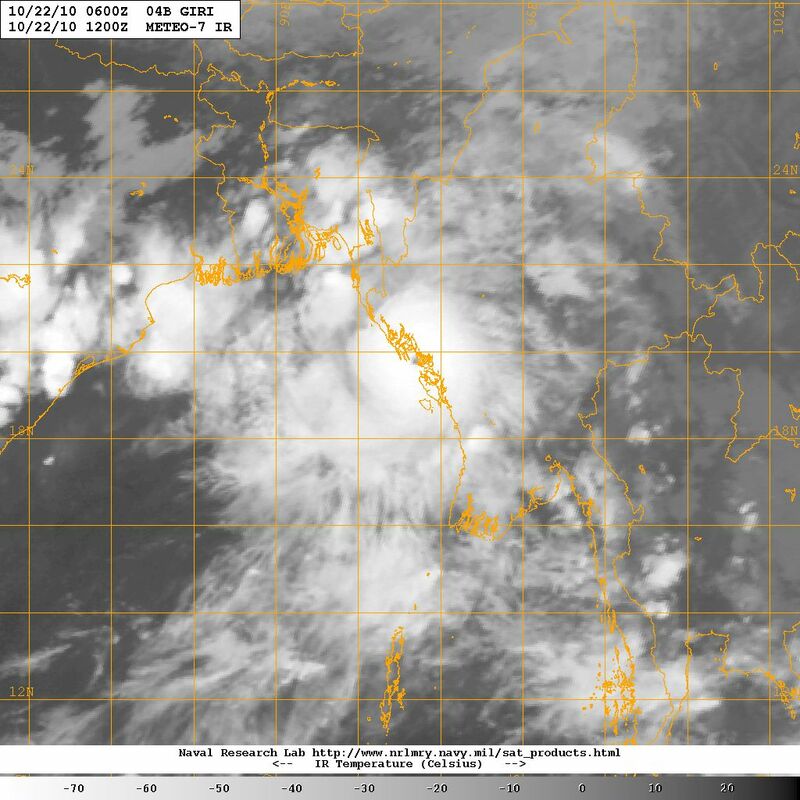 Giri brought heavy rains to a large coastal region in Burma, from Bangladesh to Rangoon, and s Thailand. It is possible that the combination of storm surge and heavy rain may have caused considerable coastal flooding and damage. Going east from the Bay of Bengal, the Indian Ocean, some 1600 miles to the western Pacific and the South China Sea there is Typhoon MEGI, which formed on 13 October over the western Pacific reaching category 5 strength by 16 October before making landfall in Luzon, the Philippines. Satellite view of Typhoon Megi over the South China Sea on 22 October 2010 as it approaches landfall near the coastal city of Xiamen some time in the morning of 23 October 2010, which will be the evening of 22 October in the USA East Coast. 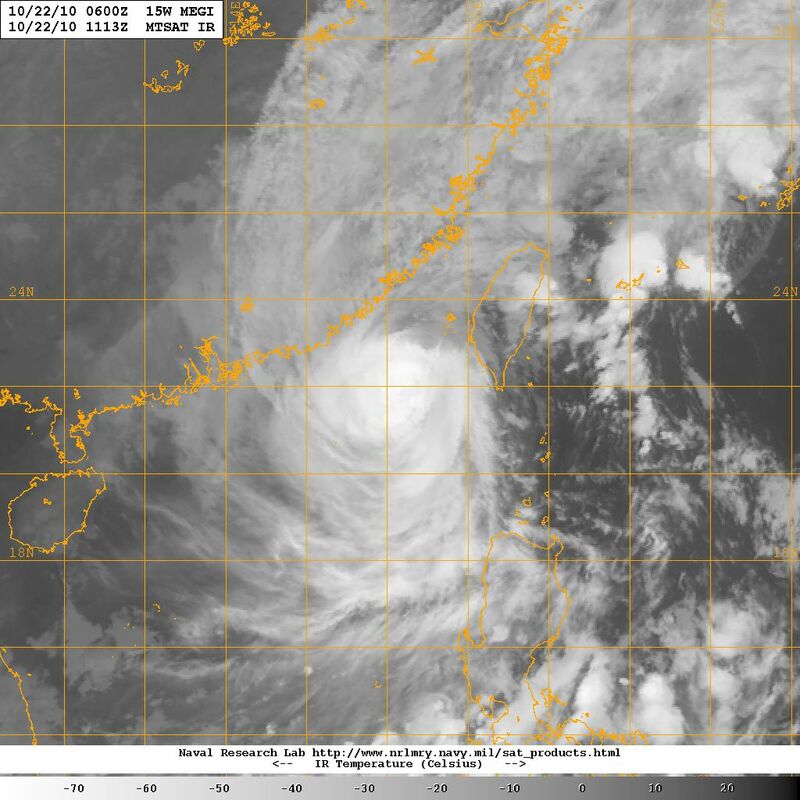 MEGI has weakened somewhat as it moves slowly, at 7 mph, and it has become a much smaller system over the past 24 hours as it approaches mainland China with sustained 110 mph winds while also generating plenty of rain over a wide region. The track that MEGI has followed since emerging over the South China Sea has varied considerably in direction and it has also had noticeable wobble, which has made it difficult to predict. Navy Research Laboratory projected track for Typhoon MEGI. Notice the mode than 100 degrees change in direction since the cyclone emerged over the South China Sea. 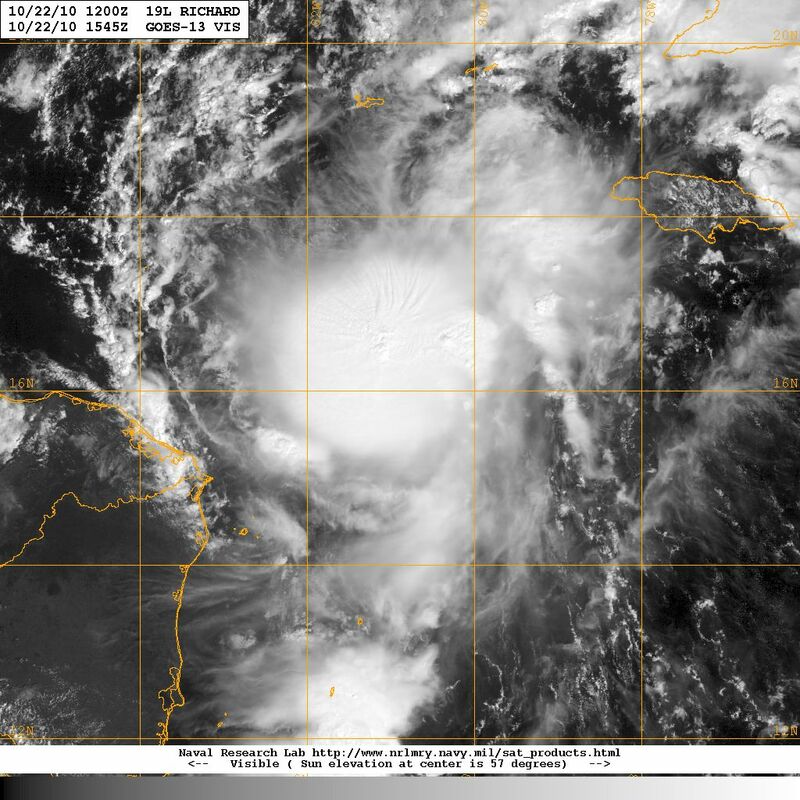 GOES satellite view of Tropical Storm RICHARD on 22 October 2010 over the central Caribbean. Closer to our neck-of-the-woods, in the Caribbean, we have an almost stationary Tropical Storm RICHARD nearing the Cabo Gracias a Dios region near the Nicaragua-Honduras border where at least two other tropical cyclones have been generated over the past few weeks. This storm has followed a track that is in the process of completing a full circle before aiming toward the west by northwest in the general direction of Belize and Quintana Roo in Mexico. Because of its current stationary condition and proximity to the landmass of Central America it has been difficult to predict future movement. Recent projected track for Tropical Storm Richard on 22 October 2010. The storm has moved further south than it had been anticipated, which has it aiming more toward the central coastline of Belize. While this activity takes place in the Caribbean there are two tropical waves riding along Hurricane Alley in the eastern Atlantic, which warrant close monitoring as they move west and approach the Lesser Antilles and the Caribbean in the next day or so. Global mosaic showing the entire Atlantic basin on 22 October 2010. Tropical Storm Richard is visible in the Caribbean, as are several tropical waves riding Hurricane Alley between coastal equatorial Africa and the Lesser Antilles, the gate to the Caribbean.